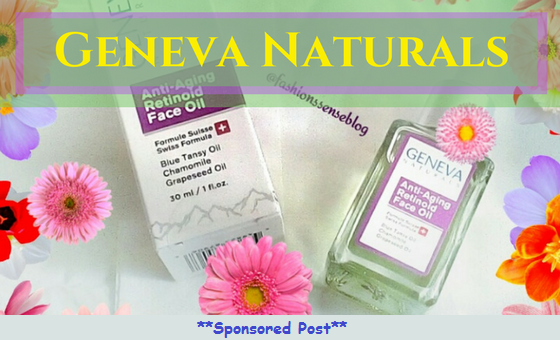 Fashion's Sense: Is Geneva Naturals Retinoid Face Oil Safe for Sensitive Skin? Is Geneva Naturals Retinoid Face Oil Safe for Sensitive Skin? TGIF, lovelies! For today's post, I want to refresh your memories in a bit of a #FlashbackFriday style by talking about retinoids and reviewing a Retinoid Face Oil I am using from Geneva Naturals. If you already read About Retinol: Important Facts You Need to Know Now, then some of the excerpts I include in this will sound familiar. If you haven't read I suggest you check it out after reading this post. Retinoids are derivatives of vitamin A. They promote skin cell turn over, thicken deeper skin layers, and slow collagen breakdown. Prescription retinoids are more potent, they work fast and often are irritating to the skin. Over the counter products containing retinoids are much gentler but they do take a little longer before ideal results are seen, typically 12 weeks. Retinoids should be taken at night because they are light sensitive. The sun breaks down retinoids thus making it inactive. Unlike retinoid serums, Geneva Naturals Anti-Aging Retinoid Face Oil is formulated to counter the negative effects some people experience using retinoid products. The oil contains Blue Tansy Oil, Chamomile, Grapeseed Oils to help give skin balance, calm redness, and calm inflammation. This is a very good thing. Redness, inflammation, and irritation are among the top side effects people experience when using retinoids. So, having a retinoid product that addresses this within the formula is a huge plus in my book. As a result, the face oil is good for use on normal, oily, combination, dry and sensitive skin types. It is a high-end skincare product costing $69.99 per 1-ounce bottle. Right off the bat, I like that the directions for this oil lets you know to not use more than five drops of the oil at a time. This means you will not use too much product on your face. You do not massage the oil into your face. You warm the oil in your palms by briskly rubbing them together to build up heat through friction. Then you press your hands into your face and let it absorb in for about a minute before you apply a moisturizer, if needed. I use this face oil after toner and serum. The smell of the oil is very herbaceous. If you are not used to that kind of smell it will take some adjusting. What I have noticed is that it does help to calm my skin down, especially my eczema patches. It keeps the red bumps at bay and has reduced the redness considerably. Start off with one drop in the beginning to see exactly how many drops you need for your face. I have a big head and three drops work fine for me. I would advise not to use this if you are using products containing benzoyl peroxide. Benzoyl peroxide already has the capacity to irritate skin and mixing it with a retinoid increase your chances for skin irritation. If you are taking acne medication, switch to a salicylic acid treatment at night and use your benzoyl peroxide during the day. If you have sensitive or dry skin, following with another retinoid or retinal product is not recommended because of increased chance for irritation. If you feel there is too much oil left over on your face after you allow it to absorb for a minute just gently press a tissue over face to blot the excess. Keep the box the oil comes in. Unfortunately, Geneva Naturals did not place the oil in a dark glass bottle to help reserve the retinoids in it. If you do get rid of the box, make sure you store the bottle in a dark, cool, dry place. Keep it away from sunlight or you risk rendering the retinoids inactive. I like this product. I expect the long-term effects to be the same as other retinoids I've used. However, this product is more skin nourishing than other products I've used in my opinion. A little goes a long way so spending $69.99 on a 1-ounce bottle is not that expensive when your factor the cost over time. My one suggestion to the company is to make a new bottle for the oil. It really should be in a dark glass bottle. Is a retinoid face oil something you might consider trying for your anti-aging needs?